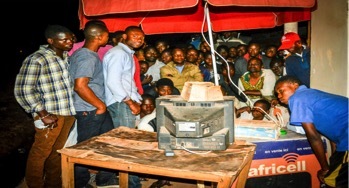 Football fans watch the UEFA Champions League Final in Lubumbashi, Democratic Republic of the Congo. On June 3, 2017, people gathered in their homes in Kolwezi, a mining town in the southeast of the Democratic Republic of Congo (DRC). They began to watch the European Champions League final match when, suddenly, the power went out. Young and old football fans angrily left their homes for public bars in areas where power is more stable. They clustered around television sets and overflowed into the street. This power outage is part of a much bigger problem in the DRC which has one of the lowest electricity supply rates in the world. Only about 13.5 per cent of the population has access to electricity. The lack of power contrasts markedly with the abundance of mineral resources below ground. “With 80 million hectares of arable land and over 1,100 minerals and precious metals identified, the DRC has the potential to become one of the richest economies on the African continent and a driver of African growth, provided the country manages to overcome political instability,” the World Bank says. In this paradox, the mining industry offers a possible solution to the country’s energy crisis. Projects need power to operate, so what if, instead of generating their own electricity on-site, mines could become reliable and essential customers, guaranteeing business for utilities and independent power producers alike? In 2002, the government released a new mining code meant to liberalize the mining sector and attract private investment. The DRC’s government resolved to gradually withdraw from the electricity sector. The idea was to make the sector more competitive while creating an institutional, legal and regulatory framework for attracting public and private capital. Major companies, largely based in the mineral rich southeastern portion of the country — formerly known as the Katanga province — gradually moved in. To continue working, they had to install generators or purchase electricity from neighbouring Zambia. A few large private mining companies, most of them located in remote areas, invested millions in the rehabilitation and modernization of existing government infrastructure. “Power–mining integration can create a win-win situation,” the report says. “Mining companies could be anchor customers for utilities, facilitating generation and transmission investments by producing the economies of scale needed for large infrastructure projects, in turn benefiting all consumers.” Basically, because they need so much energy to extract resources, companies are forced to figure out how to generate power which can speed up energy access for communities. Samuel Kabulo, an apostle of the Restoration in Jesus Christ Church, says he has been having trouble since he was posted to Fungurume. Kabulo heads a new denominational radio station called “The Radio of Restoration in Jesus.” Getting his message out comes at a high cost — the pastor must generate his own electricity. The Tenke Fungurume copper mine in the Katanga province of the DRC. The lack of power for residents of Fungurume is contrasted by the massive production happening locally at Tenke Fungurume Mining Company, a controversial Chinese company. The multi-billion dollar company owns one of the world’s largest known copper and cobalt reserves. Their production accounts for 3 to 4 per cent of the DRC’s total GDP and requires a massive amount of electricity. So, in 2009, Tenke Fungurume Mining Company invested more than $215 million US to modernize a nearby hydroelectric power station. The Nseke power station, built in 1956, was once the largest power-generating plant in the southern Katanga mining region. It had fallen into disrepair and the mining company, needing power to continue to extract resources, wanted to fix it. “The rehabilitation of the Nseke Dam is 95 per cent executed,” he says. “Once the fourth group is finished, it will be in reserve due to the storage capacity of the water, which only allows us to operate with three machines. If we operate all four machines, the lake will empty to a level below the minimum operating level, which means that the population will not totally benefit from the electricity generated by the Nseke dam,” says Seya. In 2011, another of the country’s largest mining companies, Kamoto Copper Company (KCC), decided to partner with the state-owned SNEL to revitalize a high voltage electrical system project. KCC invested over $368 million US in repairing the Nzilo hydroelectric power station and upgrading a transmission line carrying electricity some 1,700 km from the Inga hydroelectric plant on the Congo River to Kolwezi in the Katanga mining region. Yet again, despite this investment, life has yet to change meaningfully in the region, much of which still labours in the dark. But, says the Kamoto chairman, after work is completed on the Nzilo dam, 10 per cent of the electricity generated — over 40 megawatts — will go to the local people. Without access to reliable power, residents in Fungurume, some residents have decided to use small solar panels to generate electricity. For Kumbu, this scenario puts the government in a double bind. “We must be able to satisfy the energy needs of companies, without which the same populations who criticize us could end up unemployed and would not even be able to afford electricity bills. We will try to satisfy the population and the mining companies,” says Kumbu. Serge Tshibangu, a resident of Kolwezi, tells me companies aren’t building hydro projects out of the goodness of their hearts, so he wants to see the government be transparent. “To me, the state must change and be more transparent and more responsible. It is up to the state to address the power challenges with mining royalties,” says Tshibangu. To try to offset this situation, SNEL has signed partnerships with private companies to install solar and thermal power stations in the new provinces of Haut-Katanga and Lualaba. These projects are gradually being put in place, and are expected to be less impacted by climate change. In Manono, a remote part of Haut-Katanga province located south of the DRC, a 1 megawatt solar plant (two hectares of panels) is under construction. Built by Congo Energy, it will supply disadvantaged neighbourhoods with electricity and will be integrated into a SNEL distribution network. In the case of Kolwezi, the local government has partnered with a solar distribution company to power a health centre, among other projects.